After working the items that needed fixing, and fighting of the flu from hell, we were ready to test the Jet Nightmare for our friends south of the border. A call here, an email there, a short 6 hour drive and our friends are in Phoenix. Sometimes directions don't always translate well. When you say to turn at a particular sign, it might help to say how big the sign is. They might be looking for a billboard size sign, when in reality it is a small street sign. Enough said. 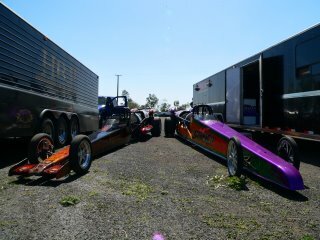 We brought out both the Jet Nightmare and the Invader out to Speedworld in Surprise Arizona. A nostalga group was holding a car show and cacklefest to raise money for a charity, and they were more than happy to add to jet dragsters to their program. We arrived and set up out of the way, and prepared both cars. Tech came and inspected both cars with no problems. My dad was driving the Jet Nightmare and I was driving the Invader. Singles only, but that way I could check over the Jet Nightmare for any problems. We both attend the drivers meeting and waited for our turn. The call came for us and we waited in the staging lanes. The short wait turned into an hour and a half as a bracket car dumped all his oil in the right lane from the starting line to about 80 feet. The track had everyone of their track support personnel scrubing, mopping, and cleaning like a madman! After the track was cleaned, and a group of dragsters went down, it was our turn. My dad was wedged into the cockpit of the car with a shoehorn! The normal driver is about 5' 6" and 150 lbs, where He is 5' 9" and a little more than 150!! With some of the controls in different places, He had to fully concentrate on the correct procedure to ensure safety of the run. The car was setup with a stock afterburner setting, and was lit. She came up to idle smooth and cool! 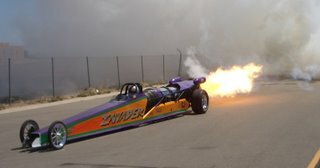 Scheduled the afterburner and WOW, she had a huge fireball!! Everything worked good except for the run. Being wedged in there, he had trouble holding down the switch for the burner and was on-off-on going down the track. Still running a mid 6 second pass, we were satisfied of the repairs. Now here is where it gets good. Coming back up into the staging lanes, the 13 second bracket cars were upset. They did not want to run after the jets, and said they would go home if we ran again! Well, we told them where they could go, but the promoter felt a little different and apologized but said we could not make another pass. So we loaded the two cars up and were done. Still wanting to test the Invader, we made arraignments to test the following Friday at Firebird. 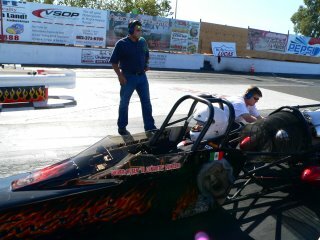 They allowed us to come in early and make a pass prior to their Friday night drags. Well, Friday come around and again we prep the Invader, get suited up, brought out to the line, I say hit it. And nothing. She does not spin over, not a chatter, squeak, grind, NOTHING! We pull back to the trailer and start checking the start pack. One of the four batteries we use to spool over the starter had shorted out internally! We were done again, with not testing! So as of today, four brand new batteries, a short trip out to the airport, a new testing session begain. One more time of prep, suit up, strapped in, and hit it! Guess what! She started in 9 seconds, super cool, and spit fire! All is good again, and the Invader is ready for the Jet Jam at Firebird in two weeks! !